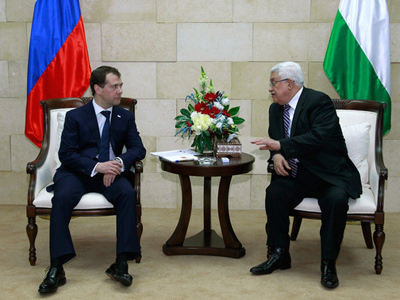 President Dmitry Medvedev is continuing his Middle East tour by visiting Jordan on Wednesday. Russia supports the creation of a Palestinian state with its capital in East Jerusalem, Medvedev confirmed during talks with King Abdullah II. Moscow will do its utmost for peace settlement in the Middle East as a co-sponsor and realizes its responsibility, the president stressed. Medvedev described Jordan as “a friendly country” for Russia and said he was optimistic about the development of bilateral relations. The king said Moscow “plays a key role” in settling the Middle East conflict and in ensuring peace in the region. 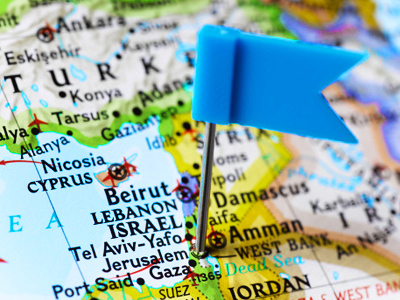 “Our two countries are unanimous in their opinion that the solution lies in establishing a Palestinian state with its capital in East Jerusalem,” Itar-Tass quoted him as saying. He promised to support Russia’s efforts to ensure the stability and peace both Palestinians and Israelis need. King Abdullah II also stressed his country is interested in broader economic cooperation with Russia, highlighting the energy sector. Russian and Jordan businessmen will meet at the bilateral economic forum to be held in March, he noted. 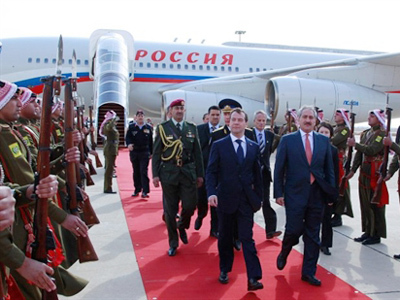 The last time Medvedev and Abdullah II met was during the king’s visit to Russia in March 2010. Medvedev is also marking the Orthodox Epiphany by visiting the place where Jesus Christ is believed to have been baptized. In Jordan, he is also to receive Orthodox pilgrims from Russia in a complex with an Orthodox church and living space. Jordan’s king approved the piece of land for unlimited use in 2006. The construction of the complex will be finished next year. The talks between Medvedev and King Abdullah II are meant“to strengthen bilateral ties” in economic cooperation, including nuclear power and humanitarian contacts, a source in the Kremlin told Interfax. The two states’ positions on many international issues are“either similar or coincide,” he said. Medvedev will open a Russian center set up at the University of Jordan in Amman, a project to expand Russia’s cultural presence in the country. ­Speaking at a press conference in the Jordanian capital Amman on Wednesday, the Russian president said that he rejected the idea of Russia’s separate mediating actions in the Middle East. "It seems to me that it is better not to divide us inside this quartet, or everyone will be offended and will say that the Russians have chosen some way of their own. We want to work together," Interfax news agency quoted Dmitry Medvedev as saying. The Russian president added that the United Nations, the European Union, the US and Russia currently agree on a lot of issues in the current situation in the Middle East. 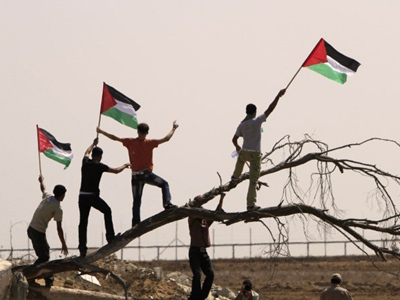 Medvedev also said that Russia was ready to support the Palestinian people in case they choose to unilaterally declare the independence of their state. "We are generally ready to go as far as the world community is generally prepared to go in supporting the Palestinians' efforts at the level of the UN," the Russian President said. He also added that he planned to meet Israeli President Shimon Peres in late January. Dmitry Medvedev stressed that Russia maintained good relations both with the Arab world and with the State of Israel and expressed hope that Russia and other members of the Mideast Quartet could contribute to the peaceful settlement in the region. Resolving the Middle East conflict is currently a top priority, Medvedev said.